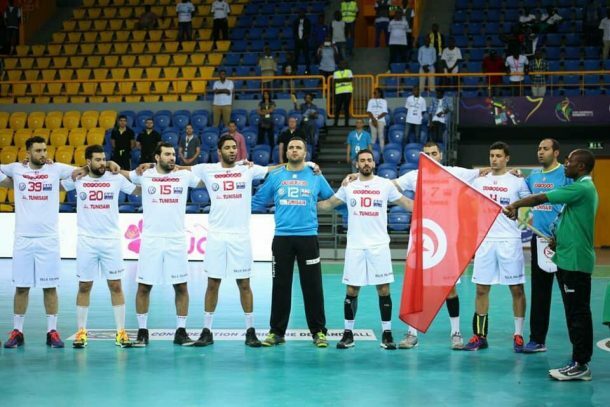 Tunisia won the 2018 African Men’s Handball Championship title after a hard-fought victory over Egypt in the final on Saturday. The Pharaohs took a 15-13 lead into the locker room at halftime. However, the Eagles of Carthage made a second half comeback to earn a 26-24 victory, wining a record-extending 10th title. They avenged their defeat in the 2016 final, which saw Egypt clinch the title after a tough 21-19 win over their North African rivals. Egypt’s road to the final in Gabon saw them defeat Morocco, Angola, Nigeria and DR Congo in the group stage before knocking out Congo at the quarter-final. They secured their spot in the final after another victory over the Atlas Lions. Tunisia, on the other hand, drew with Algeria and defeated Cameroon, Gabon, and Congo in the group stage. They then faced DR Congo and Angola in the quarters and semis, respectively. The third place playoff, which was held earlier on Saturday, saw Angola defeat Morocco 29-26 to claim the bronze medal. The top three teams – Tunisia, Egypt and Angola – secured their qualification for the World Handball Championship set to be held in both Denmark and Germany in January 2019.